Prague – 30 January 2019. A signing of the book CyberSecurity will take place at the Network and Service Security Seminar. The Seminar is organised by the CESNET Association and will be held tomorrow (31 January) in the New Building of the Czech Technical University (ČVUT) in Prague – Dejvice. It will be possible to buy the book here and have it signed by its authors after the seminar. CyberSecurity is a book released to celebrate the 20th anniversary of a series in the CZ.NIC publication. The book’s primary author is Jan Kolouch, a specialist in the application of law in cyberspace, a topic that directly affects the CESNET Association. His co-author is Pavel Bašta, who works at the CZ.NIC Association and leads the National CSIRT.CZ security team. Andrea Kropáčová, the head of CESNET Support Services and Security, contributed the chapter on CERT/CSIRT security teams. CyberSecurity deals with cybersecurity over the course of five hundred pages, starting with the basic principles of the field. The premise is that these principles should be followed by anyone who uses information and communication technologies. However, it also deals with other interpretations of legal norms related to cybersecurity. In addition to the theoretical and legal sections, the book also includes a practical section, which is intended to be especially useful for computer experts who want to learn more about this field. CyberSecurity can be downloaded for free at: https://knihy.nic.cz. The book is also available in most bookstores. 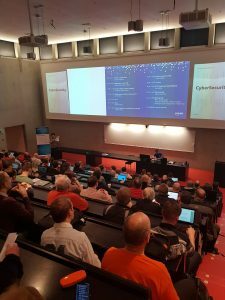 For more information about the Network and Services Security Seminar, where CESNET Association experts have annual presentations on the current topics related to security and its problems, go to: https://www.cesnet.cz/akce/bss19/. The CESNET association was founded by various Czech universities and the Czech Academy of Sciences in 1996. It has built and developed the national CESNET e-infrastructure, designed for science, research, and education, including a computer network, computing grids, data repositories, and an environment for collaboration, and offers a wide range of services for universities, scientific research facilities, and other institutions. The association also does its own research and development of information and communications technology, and represents the Czech Republic in major international projects, particularly those related to building the pan-European GÉANT network. CESNET places great emphasis on the security of network operations, services, and user data.